With 425 wineries spread throughout 17 different viticulture areas in Sonoma County, it would take even the most dedicated wine lover months to properly sample all of the wines this Northern California wine growing region has to offer. On our fourth trip back to Sonoma, still in search of that perfect chardonnay, we decided to park the car, stay for two nights and wine taste in the small town of Sonoma. Located in the southern part of Sonoma County, the town of Sonoma is not too far from the Napa wine region. While not as large or commercial or touristy as Healdsburg, Sonoma now has over 25 wine tasting rooms in and around the Mexican era plaza in the heart of the town. Many of the wine tasting rooms we visited or peeked into had living room style or lounge seating and bar stools or seats at the wine tasting counter. What a refreshing change from the usual “belly up to the bar” in a crowded wine tasting room! With so many to choose from, we started at the Lake Sonoma tasting room at 134 Church Street. Fortunately for us, we visited on a rainy day in January in the middle of the week. As the only guests there, we had the full attention of the wine server and enjoyed several tastings. But, we’re talking about chardonnay here, so be sure to sample their 2014 chardonnay out of the Russian River. Next, we headed to the Ledson Hotel, on 1st Street East, for wine tasting in the lobby of this historic hotel, offering wines from Ledson and Zina Hyde. A little pricey for my pocketbook, but do try the Ledson 2014 Russian River Chardonnay and the Zina Hyde 2014 Anderson Valley Chardonnay Reserve. We also spent some time at Passagio, 25 East Napa Street, known as the “White House” for all of the whites that their winemaker produces. They specialize in small, handcrafted wines made in fruit forward style. Their 2014 chardonnay was an unoaked style, not normally my favorite, but because the true flavor of the chardonnay grape comes out in this one, I did enjoy it. Next door to Passagio is Two Amigos Wines. We sampled two chardonnays here, upon the recommendation of the wine server at Passagio. We tasted a barrel fermented chardonnay and an unoaked chardonnay. My tasting partner prefers unoaked and I prefer oaked, so we bought them both! So now I’ve given you a sampling of wine tasting rooms and a reason to park, stay and wine taste in Sonoma. But, you’re going to need some recommendations for places to stay and eat. For lunch try the Sonoma Cheese Factory on Spain Street for authentic barbeque. The pulled pork sandwich caught our attention and was just as delicious to eat as it looked on the plate. Sonoma Cheese Factory also offers wine tasting. Enjoy a sampling of wines or a glass of wine with your lunch. Also, a gourmet store, this place is perfect for putting together a picnic lunch. Mary’s Pizza Shack at 8 West Spain street, a chain restaurant in Northern California, might not be your top choice in this town full of gourmet restaurants. But the fire on the patio drew us in on a cold, rainy day and I’m glad we stopped by. The menu is full of Italian and comfort food options, but the wedge salad was one of the best I’ve ever tried. For dinner, dine on gourmet Portuguese cuisine at La Salette, 452 First Street East. Opt for the wine pairing that is offered with the dining choices. Generous pours, perfectly paired with the appetizers, entrees and dessert, allows you to sample more Sonoma County wine and makes for an extra special dining experience. I do recommend making reservations in advance. Sonoma Grille, at 165 W. Napa Street, frequented by locals and tourists alike, was packed on this cold, rainy night in the middle of the week in the middle of January. Thinking that was a good sign, we stopped in there for dinner on our second night. Seafood and steak are both great options at this place. The fact that our server from the Lake Sonoma wine tasting room earlier that day was there for dinner that evening just confirmed our guess about the quality of the food and dining experience. The Girl and a Fig at 362 West Napa Street, is famous for its gourmet food. Alas, they were closed the two days we were there. Apparently there is a ritual in Sonoma for restaurants and hotels to close sometime in January each year for a deep cleaning. But, we’ll hit it next time. For overnight stays, there are plenty of hotels on the Plaza or within nearby walking distance including Sonoma Hotel, Ledson Hotel, MacArthur Place and the Best Western Sonoma Valley Inn. So park your car, taste on foot and wander through the historic trappings of small town Sonoma and enjoy some of the best that Sonoma County wine regions have to offer. Sbragia Winery, north of Healdsburg, is one of our favorite wineries. Views of Lake Sonoma make this an ideal spot for sitting on the patio enjoying a glass of wine and a charcuterie board. When we received our recent wine club shipment, there were two bottles of their luscious and flavorful chardonnay, so we decided to try them both and compare. This wine club only vintage is made from Napa Valley grapes. Less oak in the nose than the Home Ranch Chardonnay, it displays some hints of stone fruit. The bouquet has sweet aromas of ripe apple and vanilla. Softer and rounder than the Home Ranch, the Limited Release is full of flavor with layers of pear, apple and a hint of hazelnut. A smooth finish indicates some balanced acidity. 15.1% alcohol. 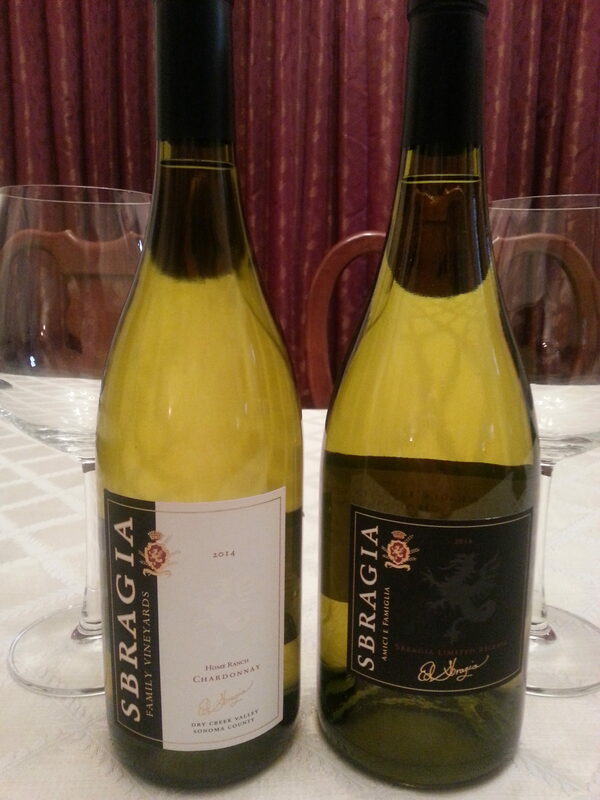 Although the Limited Release Chardonnay is not commercially available in stores or online, our experience at Sbragia has been that they are pretty willing to open up some of their special wines for customers when they ask. Tell them you read about this one and would love to try it Then be prepared for a treat!